So, do YOU know how we keep our Atmosphere attached to Earth? I do and I'm about to share it with you! Here's a great picture of our atmosphere. Here's everything you ever wanted to know about the atmosphere. 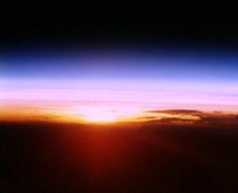 THERMOSPHERE: The thermosphere is a thermal classification of the atmosphere. In the thermosphere, temperature increases with altitude. The thermosphere includes the exosphere and part of the ionosphere. EXOSPHERE: The exosphere is the outermost layer of the Earth's atmosphere. The exosphere goes from about 400 miles (640 km) high to about 800 miles (1,280 km). The lower boundary of the exosphere is called the critical level of escape, where atmospheric pressure is very low (the gas atoms are very widely spaced) and the temperature is very low. IONOSPHERE: The ionosphere starts at about 43-50 miles (70-80 km) high and continues for hundreds of miles (about 400 miles = 640 km). It contains many ions and free electrons (plasma). The ions are created when sunlight hits atoms and tears off some electrons. Auroras occur in the ionosphere. MESOSPHERE: The mesosphere is characterized by temperatures that quickly decrease as height increases. The mesosphere extends from between 31 and 50 miles (17 to 80 kilometers) above the earth's surface. STRATOSPHERE: The stratosphere is characterized by a slight temperature increase with altitude and the absence of clouds. The stratosphere extends between 11 and 31 miles (17 to 50 kilometers) above the earth's surface. The earth's ozone layer is located in the stratosphere. Ozone, a form of oxygen, is crucial to our survival; this layer absorbs a lot of ultraviolet solar energy. Only the highest clouds (cirrus, cirrostratus, and cirrocumulus) are in the lower stratosphere. TROPOPAUSE: The tropopause is the boundary zone (or transition layer) between the troposphere and the stratosphere. The tropopause is characterized by little or no change in temperature altitude increases. TROPOSPHERE: The troposphere is the lowest region in the Earth's (or any planet's) atmosphere. On the Earth, it goes from ground (or water) level up to about 11 miles (17 kilometers) high. The weather and clouds occur in the troposphere. In the troposphere, the temperature generally decreases as altitude increases.